Drinking tea can help with diabetes. Approximately 29.1 million Americans are currently living with diagnosed or undiagnosed diabetes. That’s 9.3% of the population living with the condition. Diabetes can be life-threatening without the right diet and access to insulin. The condition is due to a person’s inability to metabolize sugar in their body. Those living with Type 1 diabetes can take insulin to decrease sugar. Yet, insulin does not help those with type 2 diabetes, so their blood sugars can rise. That’s why it might be good to learn that there is a product that can prevent or control diabetes: tea. Type 2 diabetes and obesity are often interconnected. A 2013 research review found tea could go a long way in helping to prevent the condition. The review published in the Diabetes and Metabolism Journal found green tea could prevent type 2 diabetes. People who consume six or more cups of green tea per day are 33% less likely to receive a type 2 diabetes diagnosis. Also, those who drink green tea for over a decade may have smaller waists and lower body fat. So, tea can be a great way to stay healthy and lose weight. Drinking tea can prevent diabetes because it contains a substance known as polyphenols. This is an antioxidant that’s found in every plant. The polyphenols help to regulate control of glucose. So it’s an effective way to either prevent or control type 2 diabetes. It can also widen the arteries, which will reduce blood pressure and cholesterol. What’s more, it can prevent clotting. So, not only is a great way to reduce both diabetes and heart disease, but it can reduce the risk of heart disease, too. 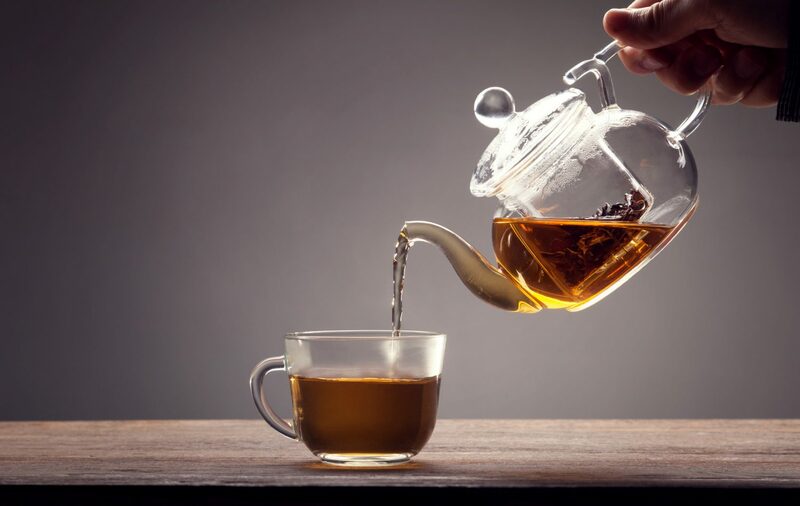 Researchers believe tea consumption could reduce spikes in a person’s blood sugar levels. A study in the Asia Pacific Journal of Clinical Nutrition tested 24 participants. Half of the participants had normal blood sugar levels. The other half had received a pre-diabetes diagnosis. Each participant was also asked to avoid exercise and eat in moderation before the trial. The participants also received a small, low sugar meal in the evening. The next morning, they fasted and had blood samples taken. They were later given a sugary drink to consume. Followed by a drink containing polyphenols or a placebo. Blood samples were then taken 30, 60, 90 and 120 minutes after the last drink. The experiment was also repeated on the same participant three times, with a gap of one week. The study found that tea polyphenols could suppress the blood sugar spikes. Tea not only helps to prevent or control diabetes, but it could also help those living with dementia. Drinking tea each day could reduce an elderly person’s risk of cognitive impairment by 50%. Those who have a genetic link to Alzheimer’s disease should drink a cup of tea each day. This could reduce their likelihood of the condition by 86%. The study also found it doesn’t matter if you enjoy green tea or black tea, because they both have the same effect on the brain. Do you think tea can improve your health? Does it help control your diabetes? We’d love to hear your thoughts. Leave a comment below.